A Storyboard Pro project is composed of many small files. Each drawing in a project is a file, which may result in projects containing over 10,000 files. This can quickly fill your storage solution with a high number of files, straining the file system and backup process. You can reduce the number of files and protect the integrity of projects by saving (packing) the project in a single file. A packed project file is appended with the .sbpz extension. The location of your packed file (*.sbpz) does not have to be in the same place as your current project file. For example, you can save the packed file on your company’s server and save the current version on your local computer. You can open a packed file in the usual way by using the File > Open command or by double clicking the file in the Explorer (Windows) or Finder (macOS). The packed file extracts to a temporary folder on your computer. When opening a project in Storyboard Pro, you can select an .sbpz file (the packed project); this file will be updated when you perform a Save and Pack. If you opened an .sboard project, you can perform a Save As to a packed format, after which that file (the packed/zipped one) will be updated by the Save and Pack. - Unpacked projects do not appear in the list of recent projects, so you don't accidentally open the project in the cache. - Multiple users cannot open the same packed project at the same time. - When working with a packed project and you have Storyboard Pro set to automatically save your project, Autosave, it is saved to the project cache. Select Edit > Preferences (Windows) or Storyboard Pro > Preferences (macOS). Select the Project Settings tab. 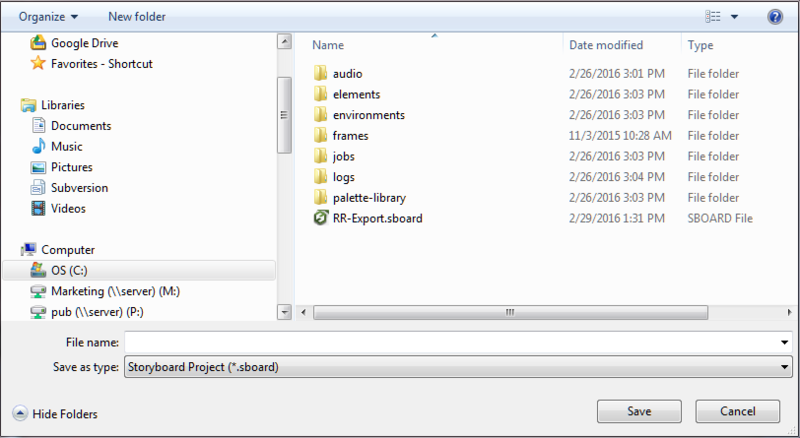 Select the Save new projects in single file format (packed file) option and click OK. Select File > Save As. The Save As window opens. In the File Name field, give your packed file a name. From the Save as Type list, select Storyboard Packed File (*.sbpz). The project is saved and zipped to the location you specified. Select File > Save to save the project to your local cache. Select File > Save and Pack to pack the project to the location you specified for your packed project. The unpacked project is saved and packed to the original zipped project file. NOTE If the project already has a file, save the project locally using the Save command , then save to the zip file using the Save and Pack command.